When it comes to drugstore beauty brands, Maybelline is one of my top favorites. I was excited to see that they recently came out with their new Clean Express!™ makeup removers which includes facial towelettes, a makeup removing lotion for the face, a water-based gel eye makeup remover, and a dual-phase waterproof eye makeup remover ($5.99, each). Since I rely heavily on eye makeup removers, I decided to give the dual-phase waterproof option a try. Maybelline's Clean Express!™ Waterproof Eye Makeup Remover is comprised of a dual phase formula that instantly activates once you give the bottle a good shake. One of the phases works to break up the makeup, while the other helps cleanse. This eye makeup remover is oil free, gentle, and safe for sensitive eyes-all qualities I look for in eye makeup removers. My everyday eye makeup typically consists of neutral eyeshadow, lots of mascara, and occasionally I throw in a bit of eyeliner if I am not in a hurry. For special outings and occasions, I go a bit heavier with the eye makeup. I am happy to report back to you all that this eye makeup remover does a nice job at removing my eye makeup-even my waterproof eyeliner. I don't use waterproof mascaras so I can't really say how effective it is at the removal of that, but honestly, I wouldn't be surprised if this stuff is just as effective on waterproof mascaras. This eye makeup remover really is gentle on the eyes, and it's not irritating in the slightest. I find that I need two cotton rounds for each eye to do the job, as opposed to the one per eye that I usually use with Lancome's Bi-Facil for minimal eye makeup days. If I go strong on the eye makeup, a third cotton round is necessary. But I don't mind the bit of extra work as the end result is satisfactory enough. After removal, my eye area is very smooth to the touch. I also notice that there is a thin, slick film left behind which I then remove with one of my makeup removal cloths, since I always tend to remove my face makeup right after I do the eyes. Overall: I am really pleased with this eye makeup remover. It's gentle on the eyes and I love that it's so affordable-It's always great finding drugstore products that work! I am curious about the Clean Express™ water-based gel eye makeup remover. The gel bit sounds like it is super refreshing. I am gonna be sure to give that one a try next. 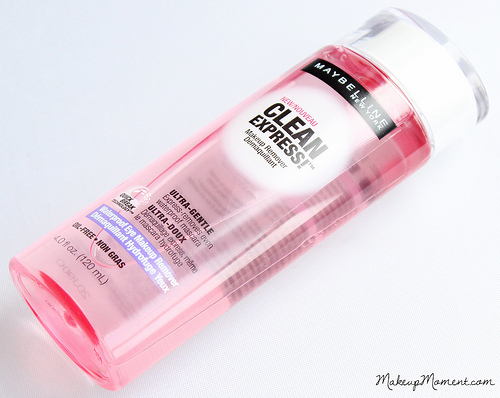 What do you all think of Maybelline's Clean Express™ Waterproof Eye Makeup Remover? Which are your favorite eye makeup removers? This sounds really nice! I use makeup remover wipes and after I wash with my cleanser I go over with extra virgin olive oil to remove the last of my makeup, but I should probably use it first since it also helps break it down. Thanks so much for stopping by and following, Ashii! I've been curious about this, I've never found anything better than bi facil. I like the price tag on this one much better.... great review!